The SPARK 3 bike carrier features lockable and easily-adjustable frame holders with soft pad for better protection. It&apos;s also foldable and space saving, and comes with a tilting platform function for tailgate access. 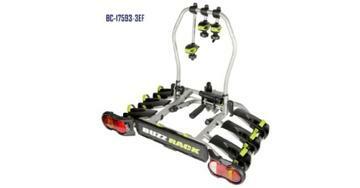 The bike carrier&apos;s wheel support design enables adjustments to fit most bike sizes. Its quick releasing ratchet straps provides easy fitting for different rims and tire sizes. The SPARK 3 is compatible with 29’’ tires wheel base up to 119cm, including 10’’ tires children bike wheel base up to 102cm.